Spring break is here and summer is right around the corner. That means fun in the sun and possible family vacations ahead. Traveling with kids in tow can already be a little nerve-racking and adding the challenges of diabetes can have you feeling like a staycation is the best route. But where’s the fun in that? 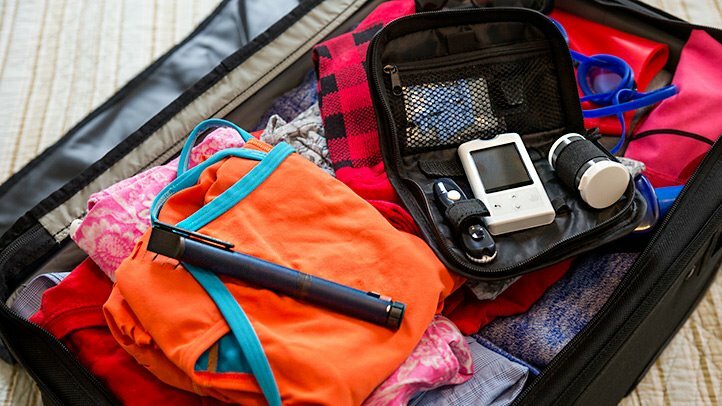 Diabetes should not hold your family back from traveling and experiencing what the world has to offer. However, there are a few things to keep in mind and prepare for before planning your next trip. Traveling across different time zones can equate to a disruption in blood sugar control. It can affect the timing of administrating medications, alter activity levels, and change sleep patterns. It is a great idea to discuss with your travels with your child’s doctor so that you can come up with a plan that will help stay as close to your child’s baseline routine as possible. Even with the best of plans be prepare that blood sugar management still might not be perfect. Since we are on the topic of doctors, it is advised that you have your child’s doctor’s approval prior to traveling. It is also a good idea to have a doctor’s letter that includes a list of medications, a list of monitoring and dispensing equipment needed to manage diabetes, details of supplies needed in your carry-on luggage (if flying), and contact information for all members of your child’s diabetes team. This letter will help you navigate security checkpoints at the airport and through customs if traveling overseas. When making a travel plan with your doctor include a plan of what to do if your child becomes ill while traveling. This may include checking urine ketones and how to seek help if needed. Your child should wear a medical ID bracelet or have a medical ID card on them at all times. Also, take note of where local hospitals and pharmacies are located before you leave for your trip. It is best to have a list on hand than searching in the midst of an emergency. When packing diabetic supplies for traveling it is probably best to over pack. Heat, water, and change in activities can equate to changing pumps more frequently or increase use of insulin or low treatment. It is best to have the supplies on hand if needed than to be stuck having to refill a medication or purchase supplies in an unfamiliar place. Planning ahead will help you be prepared for the unexpected and give you peace of mind so you can have more time enjoying your trip and your family. And we all deserve peace of mind!